The December 2018 issue of Tabletalk will cover several of the most important Old Testament texts concerning the promised Messiah. When Jesus appeared to the disciples on the road to Emmaus, He told them that everything written about Him in the Law, the Prophets, and the Psalms—the Old Testament—had to be fulfilled (Luke 24:13–25). 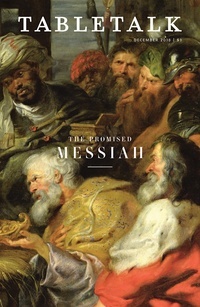 Jesus the Messiah is the center of the Hebrew Scriptures and the fulfillment of the hopes of the old covenant community, and Christians have long turned to the messianic prophecies of the Old Testament to learn about the person and work of our Savior. This issue of Tabletalk will cover several key messianic prophecies and explain how they point to Christ. Contributors include R. Andrew Compton, Michael P.V. Barrett, Peter Lee, Anthony Selvaggio, Robert Rothwell, Robert J. Cara, Stephen Coleman, Brandon D. Crowe, Scott Redd, Stephen J. Casselli, Jonty Rhodes, Max F. Rogland, John R. Muether, Tim Challies, and Nathan W. Bingham.